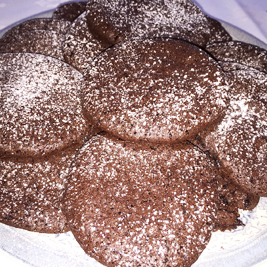 Makes 24 delicious, chocolatey, chewy FODMAP cookies treats. Whip the egg whites until forming soft peaks. Mix together the sugar, cocoa and vanilla in a separate bowl. Gradually fold in the cocoa mixture. Drop by tablespoon full onto the baking sheet ensuring that they are far enough apart. Bake for 8 – 10 minutes until slightly puffed up and a slight crust on top. Remove from oven and allow to cool on the tray. Learn more about FODMAP Eating here.